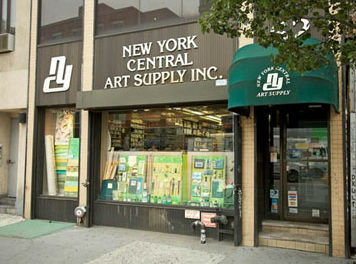 As many of you may already know, New York Central – an iconic art supply store in the east village here in NYC – has announced its closing later this summer. In addition to the who's who list of artists who've walked through its doors, New York Central was known for its extensive paper department. With Central gone, we've seen a lot of artists asking "what now" for these amazing artist papers from around the world. Having been fortunate to have been their largest paper supplier for decades (the "guy behind the guy"), I can assure everyone that hundreds - if not more - of the papers they stocked will still be available for years to come. Contact us and we can help you locate what you need and would be excited to build new relationships, creating papers for tomorrow's art world legends. While Central's closure is a sad day for artists, it's affected me personally. They were my very first art store account when I started selling art paper in 1971. That was also the beginning of a wonderful 44 year friendship with Steve Steinberg, the former owner, who passed away last year. Roughly 35 years ago, David Aldera joined NYCS as one of the most knowledgeable art paper experts in the world and also a dear friend. I'm very grateful and fortunate to have had decades of collaboration with these two industry legends. Over the years we worked together to develop papers for renowned artists too numerous to name. They were always the first voices I sought when developing a new paper (including Stonehenge and Coventry) or considering bringing something in from overseas (Somerset, Zerkall, Revere). NYC is losing an institution. They will be missed. Michael Ginsburg, co-founder, Legion Paper.